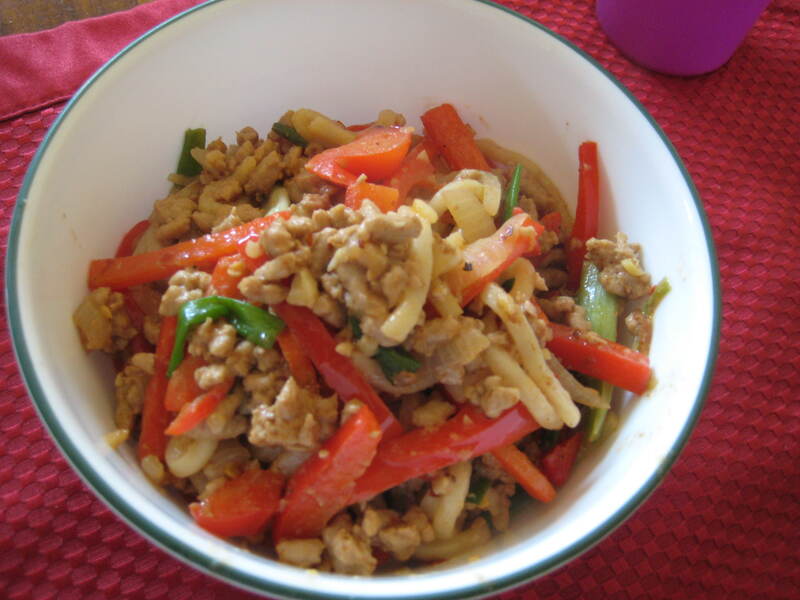 Today for breakfast Robert and I made spicy udon noodles with ground pork, tossed in a garlicky, spicy, and creamy sauce. Mixing the pork in with the sauteed vegetables. Tossing in the noodles and the sauce. Breakfast is ready! The creaminess off the sauce balanced out with some of the spice, so it’s not too intense. Overall I would say this was a pretty good (and quick!) breakfast. I got the idea for this from Benihana’s Seafood Diablo, but this is definitely toned down a bit in the heat department; next time I make this I’ll remember to add some Sriracha to the sauce for an extra kick! With this recipe you can adjust any of the spices used to your taste. 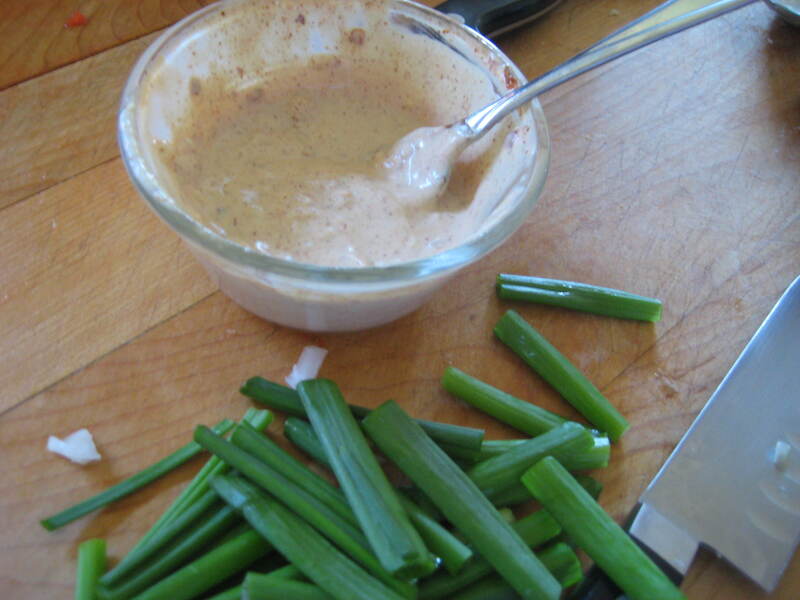 For sauce: combine mayo, garlic, paprika, cayenne, ginger, mustard, soy sauce, vinegar, hot sauce, and salt and pepper. Taste and add more heat as you like, and set aside. In a large skillet, heat vegetable oil, add onions, cook until soft. Season pork with salt and pepper, and brown in skillet. While meat is cooking, bring a pot of water to a boil, and cook noodles for 2-3 minutes, or as package directs, drain, and set aside. 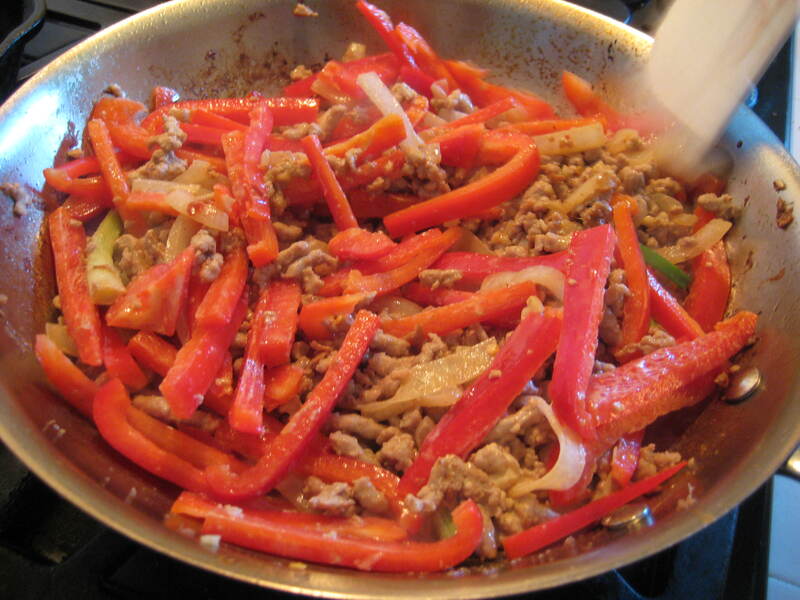 Add red pepper, grated ginger, and 1/3 of sauce mixture to skillet, saute until red pepper softens. 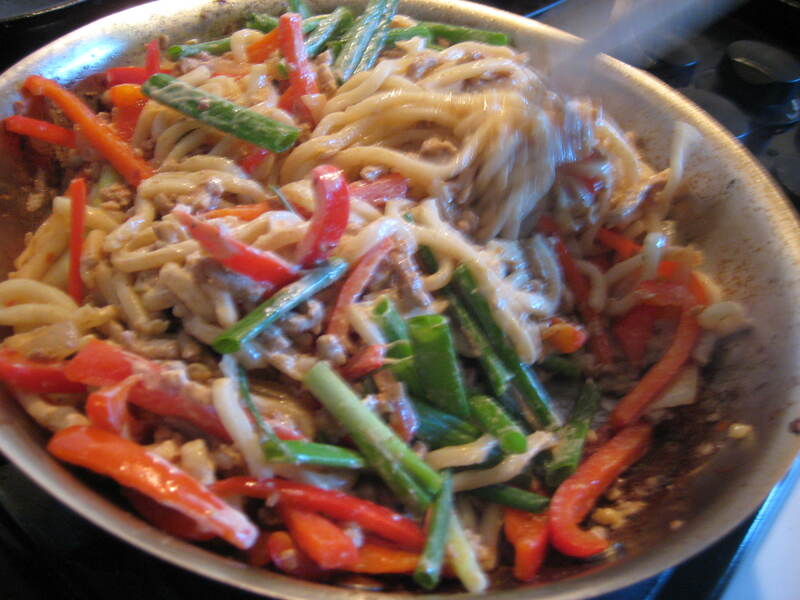 Add drained noodles, scallions, and the rest of your sauce to the skillet, and toss to combine. Cook until scallions have wilted.